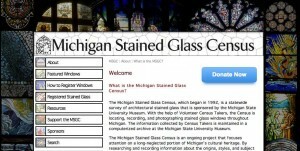 For stained glass lovers in or visiting Michigan check out this the Michigan Stained Glass Census, a 20 year old effort to catalogue and record architectural stained glass in the state of Michigan. At this point over 1400 buildings have been documented, although many are as yet incomplete due to missing forms, or a photo of the exterior of the building, etc. The MSGC is under the auspices of Michigan State University Museum in East Lansing and all the paper records, slides, digital photos, church history books, artist/studio information and other ephemera is numbered consecutively from when the census began in 1992, and alphabetically by city in order to ascertain the extent of regional buildings.